So far, the Obama Administration has "promised us a Cadillac but delivers us a 3 speed bicycle with 2 flat tires". It's hard to tell where we have arrived with Iran at this point in time on this bicycle pedaled by John Kerry, but you can bet your booties that Israel and Saudi Arabia are not happy with it at all. John Kerry doesn't seem to mind that. However, "while the U.S. has welcomed the moderate statements by Rouhani, U.S. Secretary of State John Kerry said in a meeting with Netanyahu last week that no deal with Iran was better than a bad deal. The negotiators nodded positively to Iran to lift for 6 months some financial sanctions that have crippled the Iranian economy. "Ah, fellas, we really didn't mean to do that! So sorry." After all, Iran has only threatened 100 times to drive Israel into the sea, Israelis being only apes and pigs and such like saying they had no history in Israel at all. Whatever is bothering Israel about their rants and ravings? The negotiators think they have reached a deal to curtail Iran's nuclear program and expand inspections in exchange for lifting sanctions, which was keeping them from getting to their goal in the first place. Wasn't it Obama that assured Netnayahu that they were standing together in this? Obama wasn't going to let Iran get the uranium power? Saudi Arabia joins Israel in their worry about a Shi'ite power threatening their Sunni position in the Middle East. 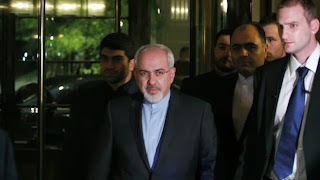 For some reason, John Kerry, Secretary of State of the USA and Javed Zarif, Iranian Foreign Minister are telling us that this will keep the Middle East from exploding into military action and that now there will be no nuclear standoff. There has been this international demand that Iran halt the expansion of its uranium enrichment program. We have had a freeze on the installation of new centrifuges. They are high-speed machines that produce low-enriched uranium for power plants and highly enriched uranium for nuclear warheads. It's the evidence that Iran would dare to make an atomic bomb and drop it on Israel that goes along with their vile threats because they dared to return to their lands. So after putting in only 5 hours, ending at the late hour of 11:30 pm, Kerry, Zarif and the Baroness Catherine Ashton, the EU's chief foreign affairs official, had had it. Goodness knows what they were doing before to wipe them out or where they went afterwards. The meeting took place in Geneva, Switzerland at the EU's Mission to the UN. Their days must start at a late hour. They thought they would end the evening with a simple signing ceremony and see now that talks must continue next week! They have been disagreeing over Iran's building a plutonium reactor which would lead to an atomic bomb. This interim accord they want to reach just hasn't got there yet, and they've already said they'd lift these sanctions. There was a time when Jews loved Iranians. It was back in the days when Babylonia had conquered Jerusalem and had taken thousands as prisoners and hauled them to Babylonia in 597 and also in 586 BCE. Then along came our Prince Charming, Cyrus, II who died in 529 BCE, King of Persia, who conquered the Babylonians who had power over the old Israel and Judah. He took on an enlightened policy towards his subject peoples and in 538 BCE, granted permission to the Jewish exiles of Judah living in Babylon to return to their homeland and rebuild their Temple. The Jews thought of him as a divine person and loved him for this. Persia was the home of Jews who lived throughout its 127 provinces and many had lived in the capital, Susa (Shushan) from the 4th century BCE onward. The Babylonian Talmud was written here during Persian rule. Our history of the beautiful Queen Esther being married to King Ahashueros of Persia is celebrated in Purim every Spring when it was she who saved all the Jews in the world from total extermination from the mad Haman, the king's advisor. I've even read that Cyrus could have been the son of Queen Esther. Maybe it was Cyrus Ist. WWI changed much of the Middle East with the Ottoman Empire losing along with Germany. It also affected Persia where the British, Ottomans and Russians occupied it in 1910 before the war even started. Reza Shah became King of Iran in 1925, establishing a new name along with his new government. Jews fared well under the Shah, but not afterwards when he was exiled by Ayatollah Ruhollah Khomeini in 1979 . Life for Jews in Iran started to change with the Khomeini revolution in 1978. Many felt very uncomfortable under the strict Islamic regime which he established and left for Israel and the west. Their numbers went from 80,000 in 1978 to 20,000 in 1989. I know of some teen-aged boys who had to escape on camels during this period as they were not allowed to leave, so I doubt if you'll find any Jews speaking out against the regime today. Living under an Ayatollah is a fact. The president takes orders from him. This is a religious state with a population of more than 76,923,300. Iran is bigger than Texas. Kerry is not a man from the shuks (outdoor markets where bartering is the rule). He doesn't know how to bargain like a Middle Easterner. He was putty in Zarif's hands, and probably Zarif used his charm on the Baroness as well. I can only imagine as I wasn't there, but what a setting for a movie. He isn't thinking about Hezbollah, who hit our Marine Barracks in Lebanon in 1983, and that Hezbollah is funded by Iran. For the past 30 years this has been going on and they are now strategic partners with Iran. These 3 negotiators think that they have solved a problem of Israel bombing Iran's uranium center. By easing the sanctions that did touch the nerve centers of Iran, they have eased up to give them just what they wanted; wiggle room. During the next 6 months, Kerry thinks he can get a requirement that Iran will disclose their full history of their nuclear program that they have managed to keep secret for 18 years. Why should they ever do that? Where's the carrot to offer? They've got it! We're giving them what they want. They'll be free to secretly build now without economic worries. Kerry can wait for another 18 years and won't see anything but what they will allow the USA to see. They're big shots, now. They have stared down the big powers and got the sanctions lifted with one negotiator before midnight. This is changing the balance of regional power and is taking away the Sunni Muslim power in the Middle East and giving it to the Shi'a. Look what they just accomplished! This means that Hezbollah will have a freer hand with more finances coming from Iran. Does anyone remember the war in 1980's between Iran and Iraq? That was Sunni and Shi'a. It was pretty gruesome. It started in September 1980 and ended in August 1988. Iran had become a power with an Ayatollah and the balance had changed. In the proposed “interim” deal, sanctions against Iran will be relaxed in return for production limits being placed on Iran’s nuclear program, stopping the weapons-grade uranium enrichment, and allowing for increased inspection and monitoring. That isn't what several international lawyers say. Kerry is no international lawyer up on that law, so we see he is siding with the Palestinians. He also isn't up on Israel's history. I think he is more interested in his own resume-starting to worry about this administrations's agenda, possibly in not getting anything accomplished. Among the sticking points, Fabius of France said, was a call for Iran to halt operations at its Arak research reactor - a potential producer of bomb-grade plutonium - while the negotiating process goes on, as well as questions about Iran's stock of uranium enriched to 20 percent of fissile purity.